Some 300 participants including delegations from the African Development Bank (ADB) Group and representatives of countries in the five African sub-regions attended a Ministerial Conference on Korea-Africa Economic Cooperation held in Seoul from 24-29 April 2006. Government Ministers and top public sector officials from 20 African countries were invited to the conference jointly organized by the South Korean government and ADB to discuss strategies for the development of close economic cooperation between South Korea and Africa. ADB President Donald Kaberuka addressed the conference on ways to improve cooperation particularly between the ADB and the Export-Import Bank of Korea. The conference focused on two themes: "Business Opportunity in Africa" and "Strategy for Development of Korea-Africa Economic Cooperation." Mr. Kaberuka and the African economic delegation paied a courtesy call on the President Roh Moo-Hyun. They also met with local business leaders including the Chairman and President of Korea Eximbank, Mr. Dong-Kyu Shin. They visited such major Korean companies as Samsung Electronics Co., Hyundai Heavy Industries Co., and Hyundai Motors Co. The Republic of Korea became a State participant in the African Development Fund (ADF) on Feb. 27, 1980 and was admitted into the membership of the African Development Bank on Dec. 30, 1982. South Korea's subscribed capital to the ADB's capital stock totaled 96.234 million UA (about US$138.66 million), representing 0.466 percent of the capital stock as at 31 March 2006. The Korean government's subscriptions to ADF I–IX totaled 100.892 million UA (about US$ 145.37 million) or 0.784 percent of overall contribution to the Fund. The following are the detailed activities of the African delegation. 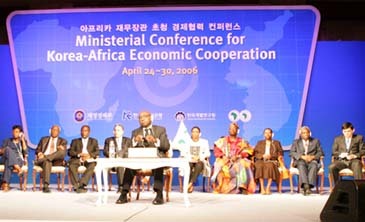 The third day of the Ministerial Conference for Korea-Africa Economic Cooperation began with the visit to Samsung Electronics' research and production center in Suwon, south of Seoul on April 26, 2006. The delegates were invited to the company's history museum and showrooms. "Samsung hopes to consolidate its relationship with Africa, furthering its presence there," said a Samsung official in a welcoming remark. Samsung began major operation and sales activities in 1995 and its flagship products for local sales include cell phones, displays and home appliances, the official noted. The guided tour to showrooms provided an opportunity to the company to present its latest high-end products to the distinguished guests, including handsets equipped with mega-pixel cameras, flat-panel digital displays and the home theater system of cutting-edge sound quality. The corporate history museum offered an overview of the company's path of growth since its establishment in 1969. "I am highly impressed and I find it very remarkable that a company, which only started 40 years ago, could go so far," said President Kaberuka in an interview with the state-run Korea Broadcasting System television. "I feel the Samsung's history itself is a testimony to the effective use of skillful labor in Korea, which helped to overcome difficulties such as lack of natural resources." The company and the delegation expressed mutual willfulness to expand the already-existing linkages between Korean enterprises and African consumers. The afternoon programs consisted of a press conference and four-hour intensive seminar. The press conference played a role to provide detailed information to the Korean local media about the ample economic opportunities that the African Continent offers. The press conference mainly concentrated on questions and answers regarding business opportunities in infrastructure, energy, telecommunication technologies and transport in Africa. In the first session Mr. Luciano Borin, Director of Private Sector Department from AfDB, gave an hour-long presentation on the title of "Business Opportunities in Africa." In-depth information was provided on the key interest areas, such as the changing prospects of Africa, the role of AfDB, the procurement policies for public sector operation, as well as private sector development opportunities. "The average real GDP growth rate across Africa as a whole is expected to reach 5.8 percent this year, while the political instability has been declining throughout the continent in the last few years," said Mr. Borin. Recent investment projects by sector (infrastructure, mining, agri-business, financial system, investment funds and tourism) were introduced to the Korean corporate participants. The presentation was followed by questions from the audience, whose major interests proved to be procurement procedures. Participants were highly encouraged to contact AfDB officials directly for more information. "The economic development, eventually, is not a matter of time but a matter of national sense of purpose, policy and commitment," said Mr.Borin in the answer to a floor question about when African countries on average will achieve the per-capita annual GDP of 5,000 to 10,000 dollars. "Look where you are today. In the 1960s, Korea's GDP level was the equivalent of Ghana's," he said, emphasizing the importance of high education and human capital building. Following Mr. Borin's introductory presentation, the second session invited the participants into exploring ways to expand the Korea-Africa economic cooperation. Professor Kim Ji-hong of KDI School of Public Policy and Management briefed on the historical aspects of economic cooperation between Korea and Africa beginning in 1970s. "Institutional preconditions in Africa are weak but Korea can assist institutional reforms in a variety of areas, such as government reform and reduction of corruption and property and contract rights institutions," said Professor Kim. Food processing industry, petrochemical plants and human resource development were also opted as the major areas with ample development potential for Korea and Africa. Dr. Juma Ngasongwa, Minister of Planning, Economy and Empowerment of Tanzania, provided historical prospects of economic relations between Korea and Tanzania. He pointed out that there are several Korean companies actively operating in Tanzania, such as Samsung Electronics, LG telecom and construction, Daesung electrical cables, Gooryong and Kabool textiles and garments. "Prospects for expansion of economic cooperation between Tanzania and the Republic of Korea are very bright even though a lot of work needs to be done," Dr. Juma said. He underlined the need to nurture and promote those potentials for closer cooperation by taking advantage of the existing bilateral relations. Moderated by Dr. Kim Chin-seung, Dean of KDI School, the subsequent question and answer session raised a number of issues, such as a suggestion for the establishment of investment promotion organ for Korea's small and medium-size companies. "There exists high possibility to expand economic cooperation between Korea and Africa. I hope today's discussion will create a new opportunity for the Korean government and companies to find out yet unknown opportunities in fast-developing Africa," said Dr. Kim in a remark that concluding the four-hour seminar. Led by President Donald Kaberuka of the African Development Bank, the delegation to the Ministerial Conference for Korea-Africa Economic Cooperation participated in a seminar on Korea's experiences of economic development. Professor Kim Choong-soo of Kyunghee University emphasized the government role in the effective economic planning. The former president of the Korea Development Institute characterized the so-called "Korean Economic Miracle" with strong government control and leadership, as well as inducement of foreign capital inflow to make up for the scarce domestic capital accumulation. The Korean economy has expanded fast during the past four decades, transforming itself from a poverty-stricken nation with less than100-dollar per-capita annual GDP in the early 1960s into the world's 11th largest trading giant. Its per-capital GDP reached 16,000 dollars in 2005. "In the 1960s and 70s, the then president Park Chung-hee himself presided over the monthly export promotion conferences in order to ensure that the government's export growth target is achieved each month. It is something unthinkable now," said Professor Kim, pointing out the Korean government's strong commitment to economic growth through export promotion. In the latter part of the seminar, economist Lee Kyung-tae of the Korea Institute for International Economic Policy focused on the role of the financial policy in Korea's economic development. "During the early stages of industrialization, the underdeveloped market mechanism should be addressed under government-led development strategy," said Dr. Lee. "But the government involvement should be conducted in a way to minimize market distortion and to ensure high-quality bureaucracy." The financial expert also underlined the need for creative adoption of the Korean development model into African countries in the age of globalization. Africa has abundant natural resources and is already open to foreign direct investment, while Korea's main source of competitiveness stems from skillful labor, he said. Each session was followed by questions from the participating delegates to presenters. Specific issue areas, such as the control of inflation and regulating the phase of economic liberalization, were further discussed, while the presenters remained cautious about government-led credit allocation because it could result in moral hazard in the private sector.